Mazda says the 2.0-litre engine has been substantially revised, with lighter pistons and con-rods, re-profiled camshafts and exhaust valves, new injectors, and redesigned air intake and throttle valve. The result is an increase in power output from 160ps to 184ps, while torque rises by a more modest 5Nm, said to be a result of higher fuel pressure and more efficient combustion. Drivers who enjoy wringing every last ounce out of the MX-5 will be pleased to hear the redline has risen from 6,800rpm to 7,500. All of this tweakery leads to a 0.8 second improvement in the 0-62mph time to 6.5 seconds, although the folding-top RF model sees only an improvement of 0.6 seconds (0.5 for the auto). 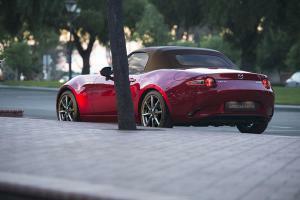 Mazda has even found time to tune the main exhaust silencer to give the 2019 MX-5 a ‘more powerful’ engine note, while the inclusion of Mazda’s clever i-Eloop and i-Stop systems mean that the new 184ps cars have lower CO2 emissions than the outgoing 160ps model, even under the new WLTP testing regime. To start with, the new 184ps engine will be offered only in the new GT Sport Nav+ trim, although it will filter down the range later in the year. Not to be left out, the smaller 1.5-litre engine benefits from reduced internal friction and improved combustion, and now produces 132ps and 152Nm. Whichever engine you opt for, all MX-5 models now feature a reach-adjustable steering wheel and an improved seat sliding mechanism. From the outside, only a new design for the 16- and 17-inch alloy wheels gives the game away. Sport Nav+ and GT Sport Nav+ cars now include Smart City Brake Support, Lane Departure Warning, Traffic Sign Recognition, and Driver Attention Alert as standard. Blind Spot Monitoring, Rear Cross Traffic Alert and Adaptive LED Headlights are standard on GT Sport Nav+ but available for Sport Nav+ as part of an optional safety pack. 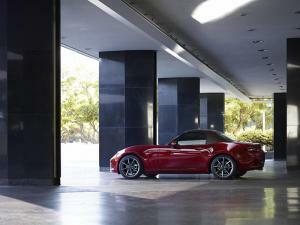 The 2019 Mazda MX-5 goes on sale from 1st September.